The Young and Volen team of Ponte Vedra Club Realty had the distinct pleasure of meeting with Dale Haney, President of Gate Hospitality, to talk through some of the exciting changes and improvements happening around the club! Have your kids spotted the big yellow slide? It’s hard to miss and I know my kids ask every time we drive by when the pool will be opening. We are super excited to tell you that it might even open TODAY! But most likely it will be Monday, April 1st. They are waiting on a final inspection from the county… and if you’ve ever had to wait on a final inspection, you know how that can go. The renovation of the family pool was actually not in the initial grand plan of projects slated for improvement. It all stemmed from the planning of the demolition and new build of Ocean House. The pool’s plumbing and heaters were all housed right next to the Ocean House and with plans to demolish the building, the need to relocate those mechanics became apparent. Plus the pool was in need or resurfacing since its last renovation in 2004, so the family pool renovation was added to list. 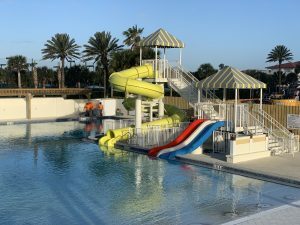 Kids, big and little, will rejoice at the new options with the large yellow tube slide for the more daring and two smaller straight slides for more the more cautious. I especially appreciate the added ladder exit beside the tube slide to make exiting the slide much easier. New additions to the pool also include two water cannons for play – kids will delight in trying to spray anyone within range. As expected, the toddler pool and gated area are no longer. The fence along the construction zone will remain, but after the completion of the new Ocean House, pergolas and additional seating will be added to make the pool area even larger. New pavers were added around much of the pool and I really like the delineation of different pavers making walkways more obvious. This will help greatly with traffic flow especially around the entrance to the pool where those lounge chairs have a habit of creeping up. There is no missing the construction of the new Ocean House. The building was recently cleared to make way for what will be an exciting new addition to the Inn’s oceanfront accommodations. 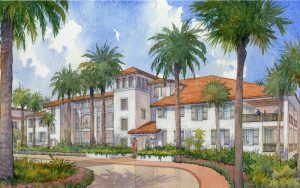 The new construction will consist of two buildings with 20 feet of vista in between that will potentially give a little peek of the ocean from Ponte Vedra Boulevard. The new buildings will house 41 guest rooms with 13 suites, two being extra large suites with fireplaces. The concept is to appeal more to larger groups and families wishing to vacation with a high-end condo feel vs. just connected hotel rooms. There will be a number of options where rooms can be added and connected to certain suites to accommodate larger groups. These building will be three stories, one floor more than other Inn oceanfront accommodations, but fear not. They will be the same height as the main Club building on the Ocean, so it will blend in nicely with the existing structures. Slated, “dream date” of completion is early summer 2020. While no new restaurants are on the docket to open in the near future, the Patio is open again for the Spring/ Summer Season boasting a brand new menu. The golf club recently underwent a renovation and is back open for lunch and dinner. The Guacamole y’all. IT. IS. THE. BEST. And if you have never hit up Italian Night or the weekend fried chicken, you are missing out (and pssst… he also told us The Lodge has a new Thursday fried chicken night if you happen to be a Lodge member too). We asked Haney about any new plans on the horizon for the future. There are so many great ideas floating out there, but like with anything else, money is a factor. New budgets are proposed in July and that’s when future plans will start to materialize. He did give us some ideas of future plans that are being floated though. A priority is to take a look at the Spa. Currently, the locker rooms are split evenly in size between men and women. But the ladies, it seems, utilize the spa much more than men. So there will be some attention given to add more space to the women’s locker rooms. Also, they would love to introduce a main corridor to the pool that would be accessible without having to walk through the locker room. That would open the possibility to utilize the spa main atrium and pool together for events and other functions and take away the awkwardness of having to walk through the locker room. Golfers take note: A renovation of the Lagoon Course is in talks which would be followed down the road with a renovation of the Ocean Course. Everyone knows it’s an issue and many long term solutions are being looked at. Off-site parking for employees is one option that could help in the meantime. All in all, it’s clear there is a BIG vision for our club, with lots of new and fun things being tossed around. Haney even mentioned they would really love a basketball court on the property and introducing pickleball to the mix! I walked away knowing there is a shared vision of a luxury resort that appeals to travelers but also is looking to foster community amongst its members. We are excited to see what the future holds at PVIC.